Helvey’s Mill Shelter, Va. — mile 589.7 from Georgia. Being a pseudo macho type, I’m not sure what degree of tragedy is truly associated with breaking a finger nail. I suspect it depends on age and gender. Two days ago something analogous happened. My right trekking pole lost its tip in a tiny cravass between two rocks on the trail. At first I didn’t notice. What with trying to read the rocks under the leaf litter, I had enough to do just to stay vertical. At some point I noticed my right pole was blooming like a brown leafy bouquet. What the …. is that? I. scrapped it off to discover the rubber tip was gone. Oh the tragedy of it. Now I sound like a peg leg pirate thump, thump, thumping along the path. It’ll scare the bears away. Worse, the other hikers (what other hikers?) might think I’m an idiot. The sound and the worry of it all! Remember the old New Yorker cartoons about the stereotypical NYC sanitation worker spearing litter with a stick with a nail on the end? That’s me. The weather forecast is good! We’re going to try and tent at Trent’s Grocery tomorrow – mile 606.0. With luck we’ll reach Woods Hole Hostel – mile 620.9 on Tuesday before dark. Actually, Jim bought a length of rubber tubing when the first of our pole tips disappeared. He cut pieces about 2.25″ long and snugged them up on the ends. They’re much better than the tips that came with the poles. I found an extra along the trail and tossed it into the side pocket of my smaller pack. Unfortunately I failed to transfer it when I changed to serious winter gear. Jim – I’m trying to decide whether or not to get trekking poles. Any pros and cons or words of advice for a newbie? The leaf bundle looǨs rather festive in a way. Trekking poles are essential. They provide amazing assistive thrust up hills – don’t underestimate this. The make excellent outriggers for balance – say stream crossing for instance. They also bring your arms into the exercise. On the down side, some people don’t know when to stop using them as in climbing. At least it happened in the south, where there are still outfitters! I hope you manage to find a replacement tip. Not that it’s a tragedy. I lost one, and I anguished over it, then I started meeting people who’d lost them months before. I actually bumped into a guy in a hostel who had an extra pair, and he sold those to me, and everybody was happy. I have a spare at home + can get one in Blacksburg. I hope this isn’t s dumb question, but why are you using the rubber tips? Should they always be used? Some people don’t think rubber tips are helpful – they prefer metal. The case for rubber includes less wear/scratches on rocks and the treadway in general. 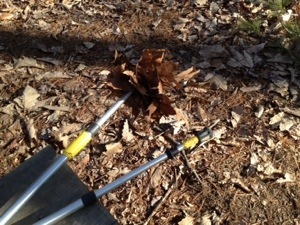 The Leave No Trace folks recommend using rubber tips. In my case, you read about the first time I lost a rubber tip.